What is Looby Loo looking at? Yup....... Aunt Sally playing with the dickie bird on a stick. 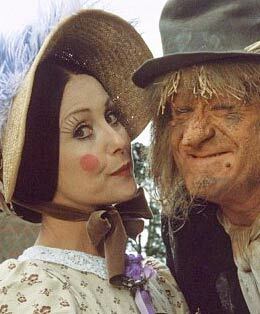 I hope some people remember Aunt Sally from Worzel Gummidge. Well, our Aunt Sally seems to be making herself at home. She mostly gets on with the others, although Lily is still in a bit of a snit. I hope she gets over it soon. Heroes come in various shapes and sizes. I didn't realise we had our very own hero just across the street. No I don't mean Merv. There is an idiot who lives at the end of the street, who last year, had one of those motorized scooter thingies. He started buzzing up and down the street even though they are actually illegal on the roads over here. One day I even saw him riding it, very fast, holding on to the handlebars with one hand and holding a baby on his other arm. I had a pink fit. If he had hit a pebble that baby would have been killed. I found out that my chum down the end had yelled at him that she would call the police if she ever saw him do it again. She then told me all would be well now as they had broken the scooter. It didn't happen again ........until this Sunday. I was trying to read the paper and Philip was downstairs in the basement fighting orcs and goblins when I heard it start. It made a dreadful noise. Of course when I looked out of the window, there he was on a new, bigger scooter whizzing up the road. A few minutes later he whizzed back. This went on for a while and I was getting sick of it. This is a very nice, quiet neighbourhood. We don't want or need anything like this on a summer's Sunday afternoon. Just as I was getting really miffed I noticed that the guy across the road was outside. He was leaning against his car, ciggie in hand....waiting. He is a big bloke. He is the sort of bloke you don't want to upset. Could he be waiting for the idiot to whizz back? Oh I hoped so, but I couldn't really believe it. He was probably just outside to have a smoke. I heard the distant buzz of the scooter. The bloke across the road was looking this way and that. It grew louder as idiot features got nearer. He appeared round the bend doing about 30 miles and hour on this thing. Super Bloke Across The Road jumped out in front of him, with his hands out, bellowing, "STOP, STOP, STOP!!!" Idiot features stopped abruptly right in front of Super Bloke Across The Road. Super Bloke Across The Road was speaking to Idiot Features and it didn't look like he was enquiring as to the health of his mother. Pants I couldn't hear what he said. Super Bloke Across The Road now had his hand on Idiot Features shoulder and sort of turned him and the scooter around. Idiot Features quietly went back the way the had come and we didn't see him again. Several neighbours congratulated Super Bloke Across The Road. I would have gone out to congratulate him too but I had just washed my hair and it was all over the place. Funny thing.....I didn't see Merv go out there. Lastly, it is barbeque season.........sigh. We have a gas grill complete with bells and whistles. So, why don't I like barbies. I think the food is pants. Just saw a photo of a friend's barbie complete with a couple of boring burgers and sad looking sausages. It always smells better than it tastes. I have tried doing fish, shrimp and kebabs on the grill but what a lot of messing about. To be remotely successful you have to do loads of sides. By the time I have prepared, baked spuds, coleslaw, pasta salad, roast tomatoes etc.......I could more easily have cooked a proper meal indoors. Plus, you don't have all the stuff to lug out and then lug in again when you are done. I really don't get the attraction of "grilling out" as they call it here.